Map of Preston and surroundings. Can you find the location of buildings shown in the photographs? 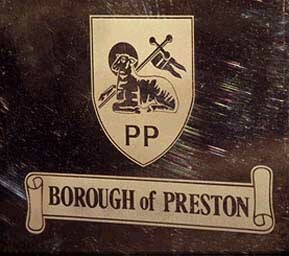 Granted city status only in the Queen's Golden Jubilee year, nevertheless Preston's history dates back to Roman times. As the lowest crossing point on the Ribble it was an important town before the Industrial Revolution. In became more prominent as Lancashire's textile industry became more important, and Richard Arkwright, inventor of the water frame, was born in the town. (The water frame was a machine which enabled water power to be used to spin cotton). The town became a major producer of cotton goods. Although the cotton industry has declined, Preston's position as a centre of administration and communication have helped it to stay fairly prosperous. The granting of University status to the former college has also brought benefits to the town. County Hall was originally built towards the end of the Victorian era, this view shows one of a number of extensions (can you work out when it was built?). County councils are a "middle tier" of government, and in many parts of England they are responsible for services such as education, social services, libraries and transport. They used to have responsibility for the police and fire services, and played a greater role in education. The town centre boasts many impressive buildings, from Georgian terraces to a modern Guild Hall. 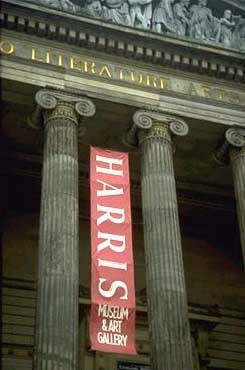 Shown in the photograph are classical influences on the front of the Harris Museum and Art Gallery. This statue commemorates four workers who were shot during the General Strike of 1842. A plaque below the sculpture states, "Several thousand workers were demonstrating against wage cuts and for the 'charter' of democratic rights." Unlike many towns, which demolished much of their town centres in the 1960s, Preston retains many of its traditional shopping streets. 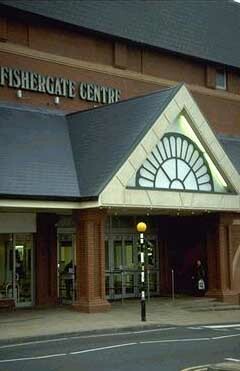 New developments, such as the Fishergate Shopping Centre, have been added to what was already there, rather than replacing it. This 1960s building houses a large bus station and car park, which are linked by subway and bridge to the Guild Hall and shopping centre. The side of the building shown is used by local buses. The opposite side is used for medium and long distance services. 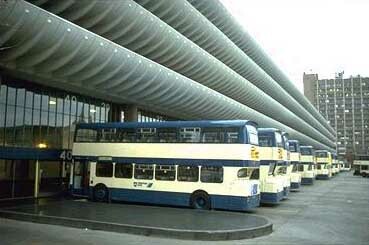 The size of the bus station is a measure of Preston's importance as a centre of communication, though at the time of writing, I believe there are plans to demolish it. 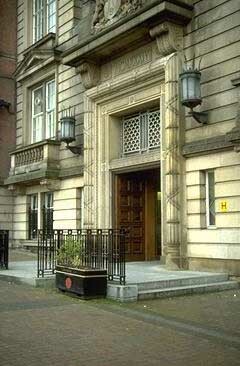 This is the former main entrance to the railway station. Although this may not appear as imposing as the bus station, Preston is an important stop on the main west coast railway line from London to Glasgow. 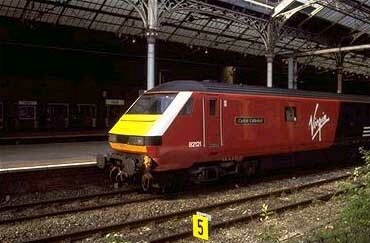 An electric locomotive waiting to travel south. The line is an important link in the rail network, but has been starved of investment in recent years. Money has been promised to upgrade the signalling and track, and Virgin railways have ordered high speed tilting trains to operate on the London to Glasgow service. 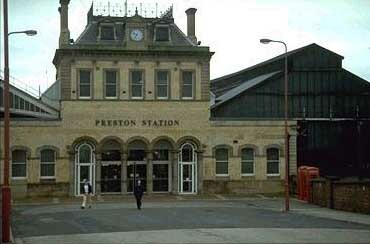 Preston is also on the Roses Rail link, a service which runs across country from York, via Leeds, to Blackpool. There are also local services to Manchester, Colne, Liverpool, etc. 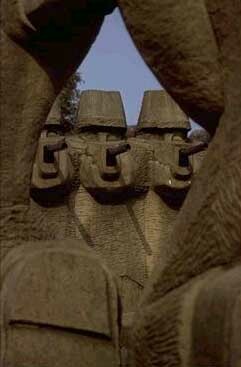 © Graham Dean 2001, 2002. River Ribble index page. Graham and Lin Dean's home page. © Graham Dean 1996 - 2006.